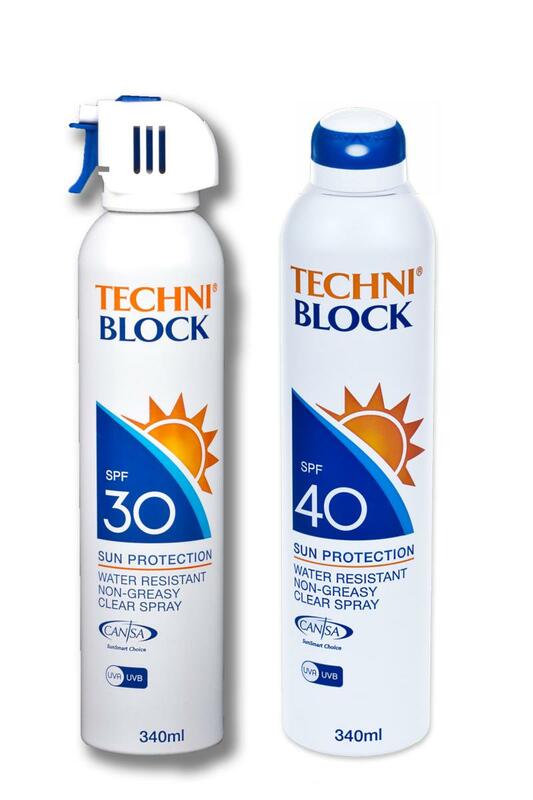 Techniblock® is the best sunscreen to prevent burning and reduce the symptoms of prickly heat! This pack is one of our best sellers and provides first-class, 5* protection against the damaging and harmful effects of UV rays. Includes a free SPF 30 75ml spray, ideal for popping in a bag or pocket for protection on-the-go! 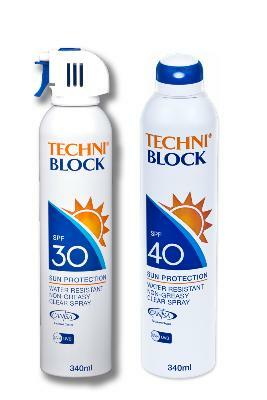 Techniblock is a CFC-free aerosol sunscreen that offers non-greasy, non-sticky, very water resistant and light-weight all day protection. It dries instantly on the skin to provide an invisible UV barrier and contains photo-stabilisers to boost performance.Protection is delivered in a cooling, continuous, clear aerosol spray that works upside down and provides simple and effortless all over application; it can even be applied to the scalp! 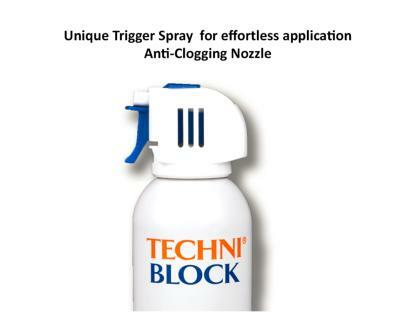 Techniblock is particularly suitable for sensitive skin because it does not contain oils or emulsifiers. 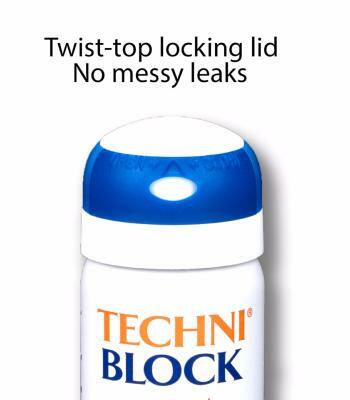 These can block pores and aggravate skin prone to prickly heat but Techniblock's lightweight and clean feel allows the skin to breathe, significantly reducing or even eradicating the symptoms of prickly heat. The ingredients that prevent sunburn are encapsulated in an ethanol-based spray that provides transparent protection that is also extremely resistant to water and perspiration. Even while swimming, you can be assured that Techniblock will continue to protect while in the water, which is why it is recommended by the Royal Yachting Association. 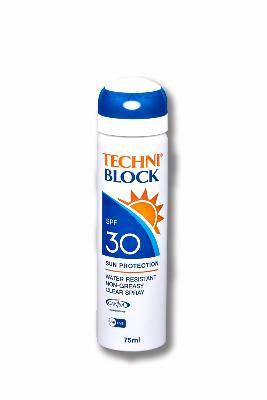 Containing anti-oxidants to enhance the skin's natural defences in the fight against the damaging and ageing effects of UV exposure, Techniblock is fragrance-free and a single application can last for 5+ hours, depending on skin type. Techniblock has no expiry date because it is packaged in a sealed and pressurised airtight container so there's no need to discard half-used product and no waste means great value for money. The unique trigger nozzle won't get clogged with sunscreen and won't leak so there's no risk of spillage in the bottom of your beach bag! Developed and manufactured to the highest standards by Technikon Pharmaceutical Laboratories in South Africa, Techniblock is a broad spectrum (UVA/UVB) protection, equivalent to Boots 5* rating system and EU compliant. This pack will provide all-over sun protection for two adults for approximately 12-14 days. Tried it for allergies and it's okay. Goes on well and dries quickly. Only downside is that one the 340ml can is activated you can't lock the trigger so transporting is going to be a concern. I was recommended these to use as my daughter suffers from heat rash and other skin problems. Fantastic sun lotion her skin has cleared up and no heat rash! Worth paying extra for a lotion that really works! Absolutely brilliant sunscreen for a family with sensitive skin. Effortless application and long lasting protection. We've been using this for 18 months and during two holidays in very hot countries and its been excellent with no burning. Very good sunscreen as always would highly recommend it. Brilliant sunscreen, would not use anything else!